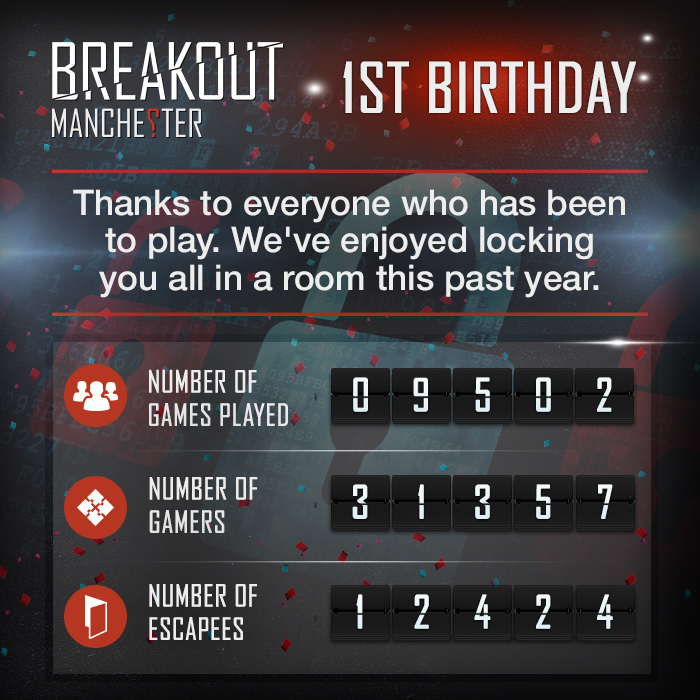 On the 22nd of May Breakout has it's first birthday! This year has flown by and we've come a very long away since we opened 12 months ago. We first opened with just one room, our classic John Monroe's Detective Office. It wasn't a smooth start to begin with, there were 4 members of staff no furniture in reception and wires galore. We then opened up our Virus room. Bookings were coming in slowly and a few more members of staff were hired. The Breakout Family began to grow. The next step was opening up a completely unique 3rd room. This room was themed around 90's Manchester and was intended to be random and difficult. It wasn't anticipated to be as difficult as it was! Staff are used as guinea pigs with new rooms so stepped up one member of staff and a couple of friends. They came out broken people it was that hard. Madchester was born. A couple of months later a new room idea was in the pipeline and staff had a chance to get involved with the making of it. This room became Sabotage which is one of our most popular rooms. With the start of 2015 we opened our 5th room infiltrate and also expanded to our second site in Manchester which is located in the Great Northern. Here we opened Classified, for the first time in the North West an escape game opened where two teams could race against each other. In March 2015 we also opened a centre in Liverpool. Breakout has come a incredibly long way in the past year, the rooms and the center are constantly developing and we have a few very exciting plans for the future. A massive thank you has to go out to all our customers, we would not be anywhere without you and also to every single member of staff who has ever worked for Breakout. Thank you so much.